Montana has spent more than a century trying to keep its politics clean. After a brazen attempt by copper magnate William A. Clark to bribe his way into the United States Senate, the state prohibited corporate campaign financing in 1912. Everything changed with the US Supreme Court’s infamous Citizens United ruling in 2010, which classified campaign expenditures by corporations as free speech and allowed donors to remain undisclosed. As a result, unlimited, anonymous “dark money” began to flood elections nationwide. In Montana, even conservative incumbents have found themselves facing coordinated smear campaigns to sway the electorate toward candidates more in line with corporate interests. But the citizens of Big Sky Country won’t allow democracy to be dismantled without putting up a fight. 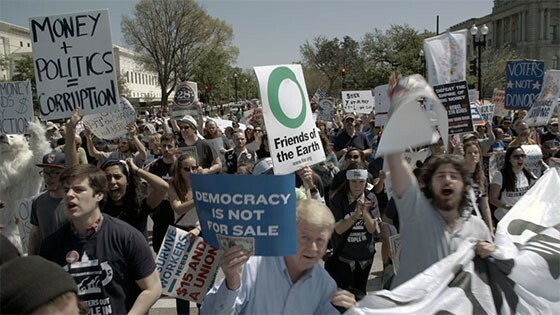 Director Kimberly Reed returns to her native state to expose the insidious reach of corporate interests into politics, and to chronicle its grassroots opposition. Profiling an intrepid investigative journalist and a crusading campaign commissioner, DARK MONEY serves as an urgent call to action to inspire campaign-finance reform across the country.